Things in the village of Dresden, Ohio move at a slower pace. The hustle and bustle of big city life is replaced by the casual swoosh of a comfy porch swing. Cars pass by slowly and the sounds of friends chatting fill the cozy porch. Surrounded by brightly colored flowers potted in warm brown Longaberger baskets, Gary and Lynn Longaberger take time to enjoy each other’s company (and some wine, of course) after a busy day. They gather with friends, laugh together and wave to the people passing by. Taking in a breath of autumn air, Lynn turned to Gary and said, “Feels like you’re back home again, doesn’t it honey?” Gary nodded. It’s a simple porch with a white and grey rug that fills almost the whole space, a sturdy gray swing, a few small tables and Grandma Bonnie’s dark green and white patio furniture that she passed down to her 10th child. Gary and Lynn chat about their grandkids and what’s going on that week. Gary is more or less retired. 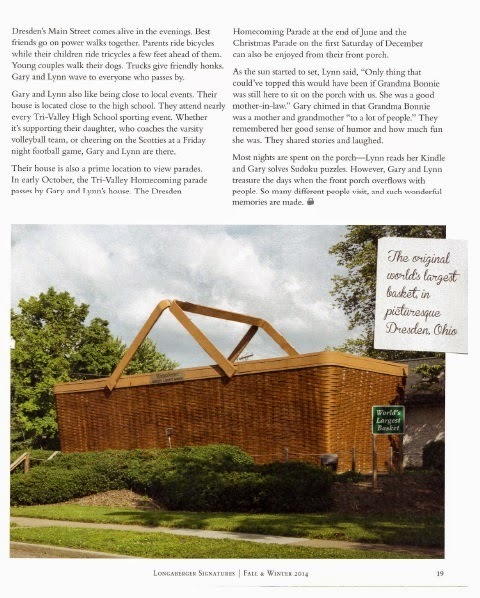 He joked that he is “on-call for Longaberger events.” Lynn is Senior Project Coordinator at the Home Office and celebrated her 22nd year with the company in November. 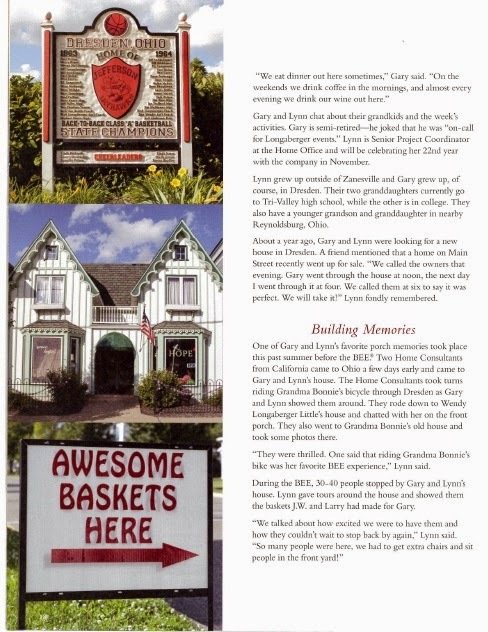 Lynn grew up just outside of Zanesville and Gary grew up, of course, in Dresden. Their two granddaughters currently go to Tri-Valley High School, while the other is in college. They also have a younger grandson and granddaughter in nearby Reynoldsburg. “The grandkids can spend the night whenever and even a few members of the Sales Field have stayed over,” Lynn said. 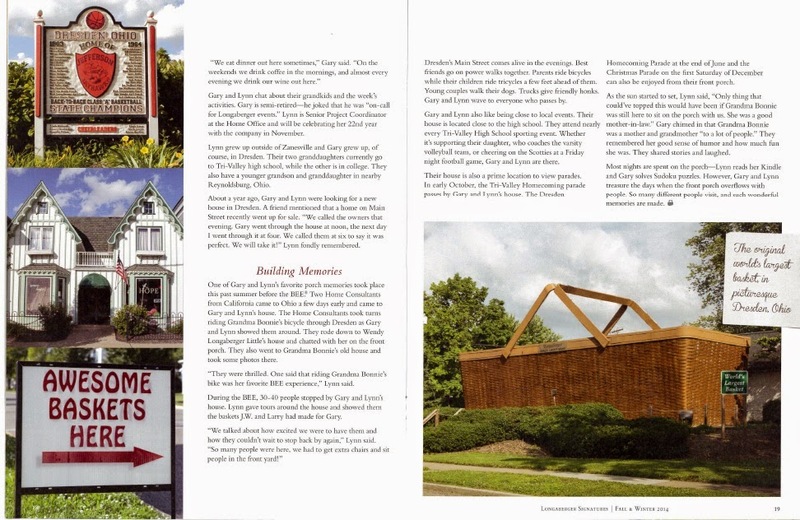 About a year ago, Gary and Lynn had been looking for a new house in Dresden. A friend mentioned that a home on Main Street recently went up for sale. “We called the owners that evening. Gary went through the house at noon. The next day, I went through it at four. We called them at six to say it was perfect. We will take it!” Lynn fondly remembered. The house has a separate garage that Gary has turned into a workshop or “mancave” as Lynn lovingly calls it. 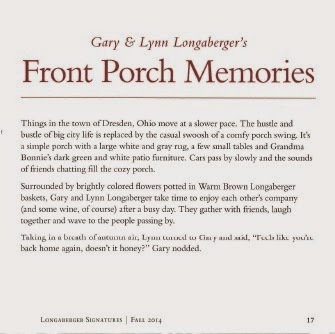 Gary and Lynn agreed that it was fun sitting out on the front porch, especially during special events like Halloween. A favorite porch memory took place before the Bee, this year. A couple of Home Consultants from California came to Ohio a few days early and came to Gary and Lynn’s house. The Home Consultants took turns riding Grandma Bonnie’s bicycle through Dresden as Gary and Lynn showed them around. They rode down to Wendy Longaberger Little’s house and chatted on her front porch for a bit. Then, they went to Grandma Bonnie’s old house and took a few pictures there. “They were thrilled to death. One woman said that riding Grandma Bonnie’s bike was her favorite Bee experience,” Lynn said. During the Bee, about 30-40 people stopped by Gary and Lynn’s house. Lynn gave tours around the house and showed them the baskets that J.W. and Larry had made for Gary. In Dresden, Main Street comes alive in the evenings. Best friends go on power walks together. Parents ride bicycles while their children ride tricycles a few feet ahead of them. Young couples walk their dogs. Trucks give friendly honks. Gary and Lynn wave to everyone who passes by. “Even if we don’t know them, we’ll wave. But, usually we know them and say hi,” Lynn said. So many different people stop by the porch and such wonderful memories are made that Lynn and a few friends joked that they were going to start a blog to chronicle their porch adventures. Most nights, Lynn reads her Kindle outside and Gary solves Sudoku puzzles. Gary and Lynn like being so close to local sports events. They attend nearly every Tri-Valley High School sporting event. Whether it’s supporting their daughter, who coaches the varsity volleyball team, or cheering on the Scotties at a Friday night football game, Gary and Lynn are there. The location of their home also comes in handy during parades. There is the Dresden Homecoming parade at the end of June, the Tri-Valley Homecoming parade in early October, and the Christmas parade on the first Saturday of December. “Tina Smythe and her family, Anita Rector, and Gary’s sister, Wendy Little with her husband Bob will bring lawn chairs and sit in our front yard and all of us will watch the parade go by,” Lynn said. They remembered her sense of humor and how much fun she was. Gary noted that his sister, Wendy, is a lot like his mom. Wendy and Bob are frequent visitors to the porch. 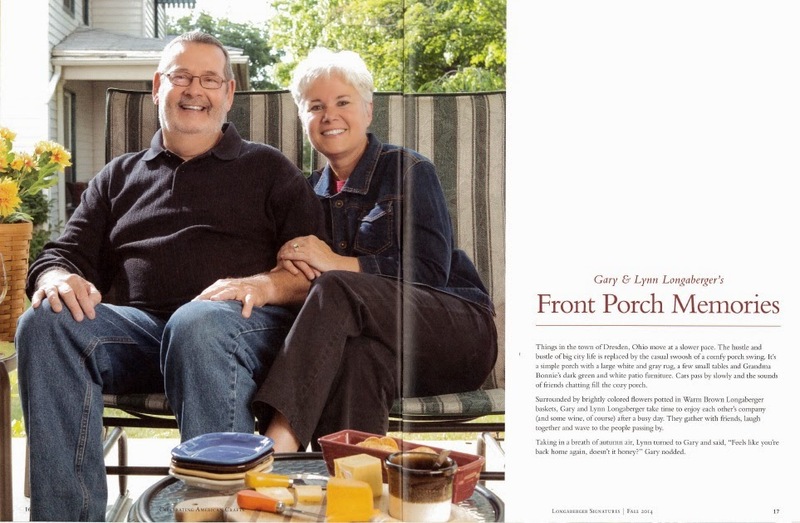 In the future, Gary and Lynn hope to add a ceiling fan and improve the back porch so it can be used “for times when the front porch overflows with people.” They are always looking up Main Street to see who will walk down the sidewalk and who they can invite on their porch.